Fake boxwood (I'm pretty sure JoAnn's does not still carry this, but Hobby Lobby and Michaels have some great choices). 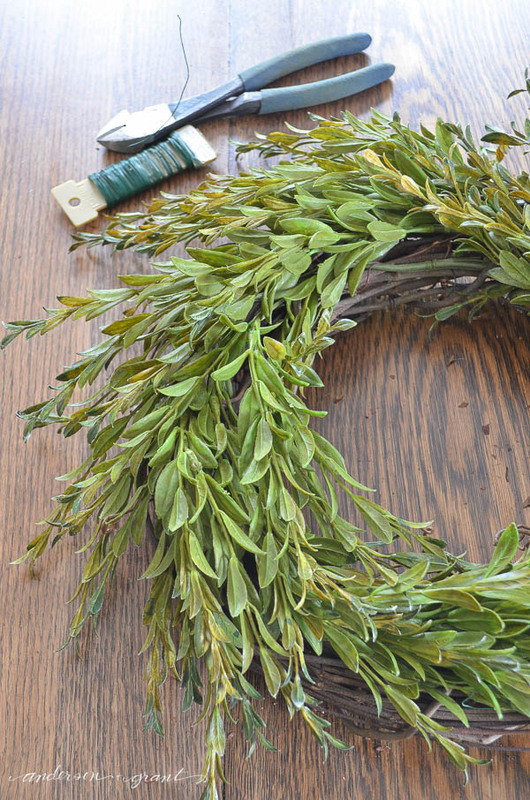 The amount of greenery that you'll need will be based on the size of wreath that you're making. 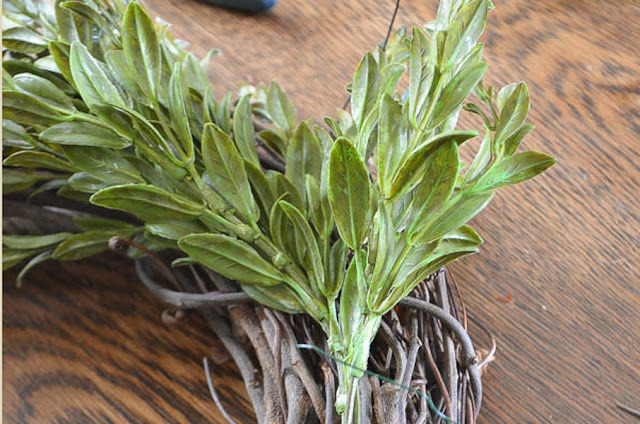 I used four bunches of the boxwood. 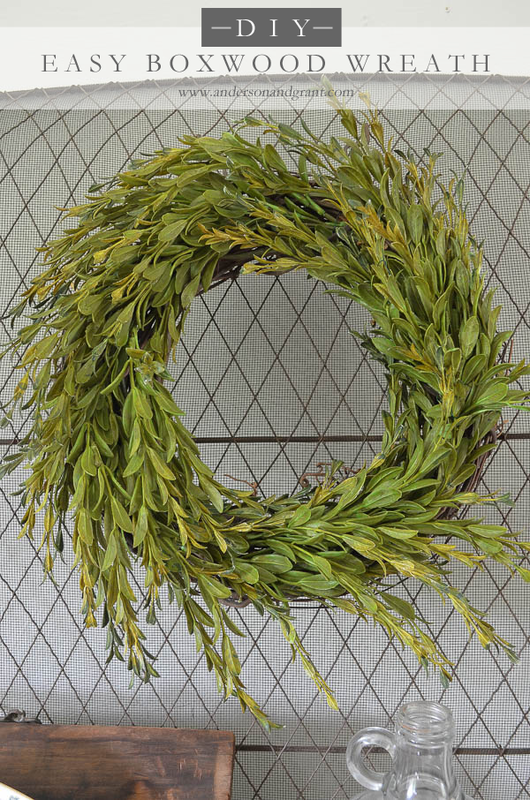 The proper way to make a wreath would involve taking the greenery off of the stem and using the paddle of wire to wrap around and around the wreath to hold the small branches together. But this is the easy version, remember? 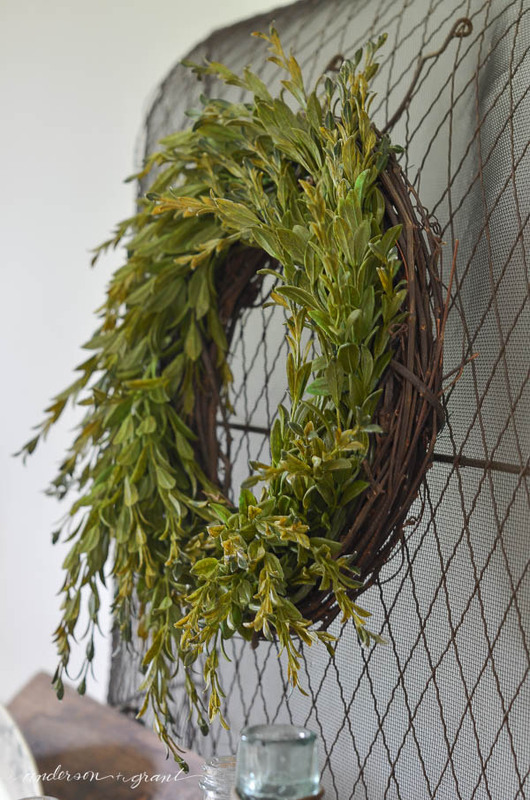 Tuck a single bunch of the greenery into the piece of grapevine that wraps around the wreath to hold it all together. 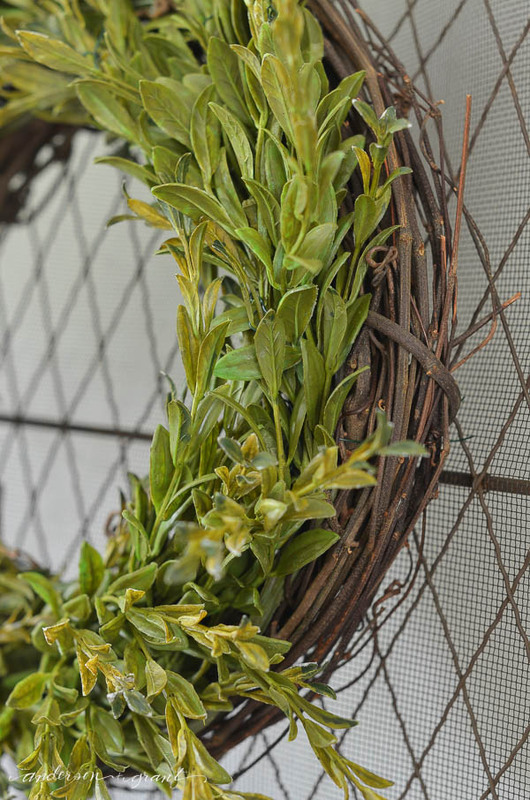 Then using short pieces of green floral wire, wire the individual stems in a few places to hold everything down. 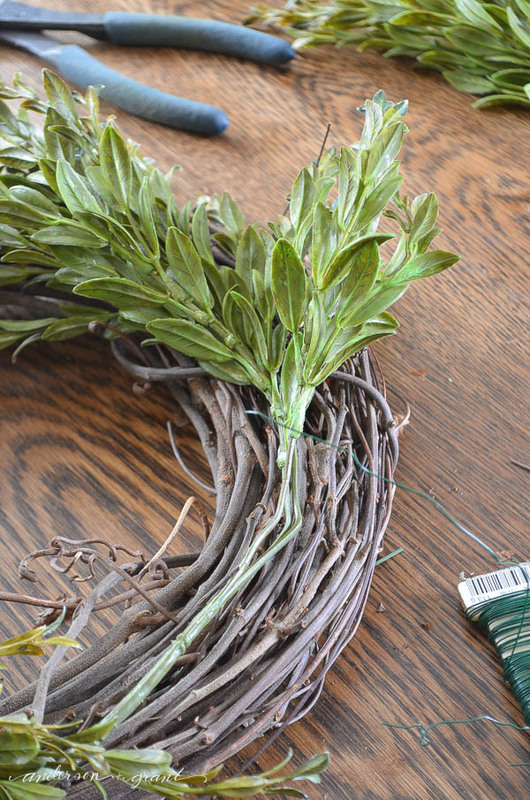 Do this the whole way around the wreath, wiring the greenery just where it needs attached. 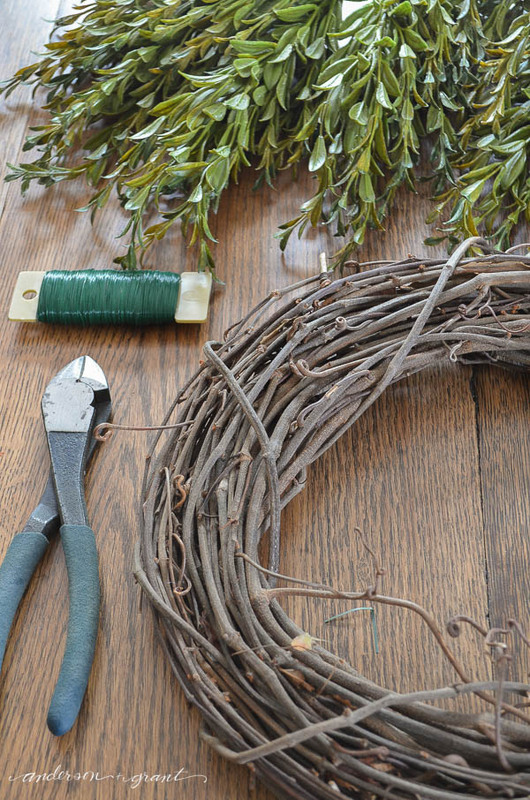 I didn't want to wrap the wire around the entire wreath because it would show, so I pulled the wire through individual pieces of the grapevine. Fluff the branches out a bit and that is it! Aren't easy projects exciting!?!? It seriously took about twenty minutes start to finish and that included getting out my supplies. The receipt was actually still in the bag for the greenery which I had purchased on sale. It came to $10 and the grapevine wreath was a yard sale purchase last year for $2. 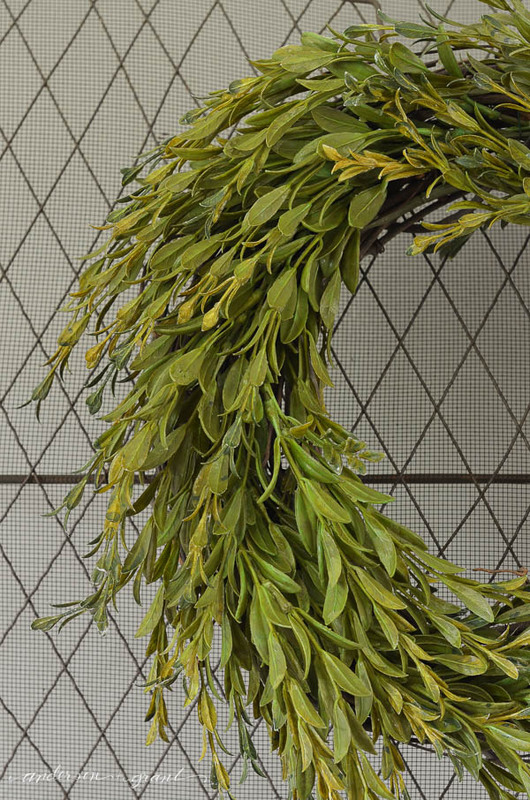 So for $12, I have a wreath that will make me happy and satisfy my desire for another piece of boxwood. And when I grow tired of my DIY, the greenery can be removed and everything can be used elsewhere. Sounds like a perfect project to me! What do you think? 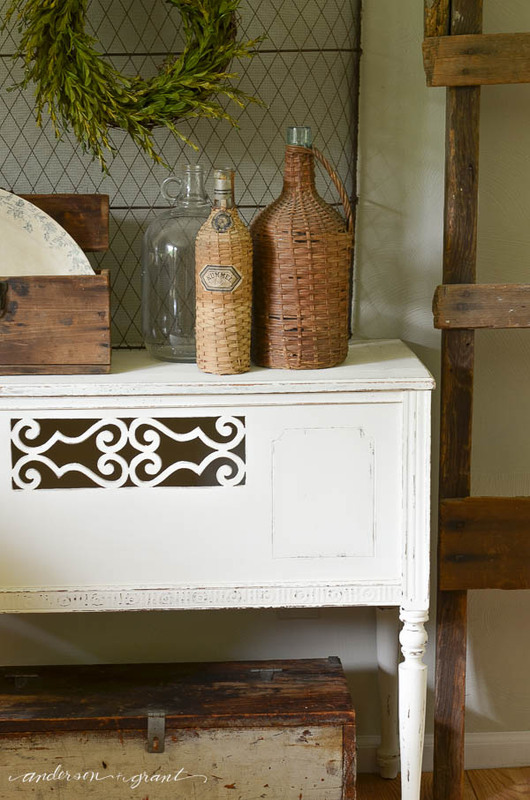 I used this wreath the other day in the vignette showcasing some of my newest purchases. The post can be viewed here. Thanks so much for visiting today. Have a fantastic weekend!